Lazies, I’m a little late with my usual Monday post – I know, it’s Tuesday. Blame my hubster Michael. He surprised me with a trip to see friends for a long weekend as an early b-day present. (Today’s my birthday!) So, grab a cuppa-cuppa and raise your mug in a java toast while you read about these adorable gifts. Julie Bridgeman shares her adorable A-Door-Ables with us today in the next ‘Show Us Your Lazy!’ project feature. 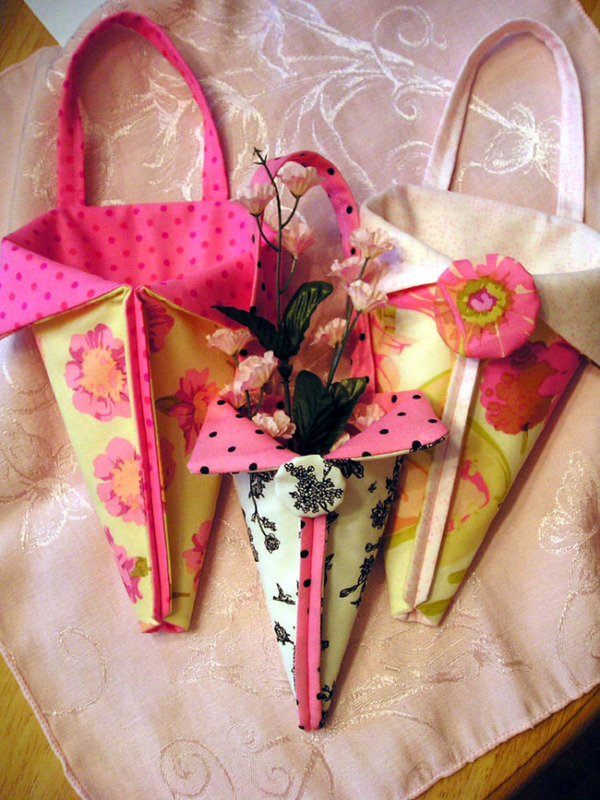 Julie used the Lazy Girl Designs ‘A-Door-Ables’ fabric accessory sewing pattern (LGD109) and the two original sizes of Clover Needlecraft Quick Yo-Yo Maker tools to make these beautiful and clever gifts. Large size shown at left and right, small size in center. 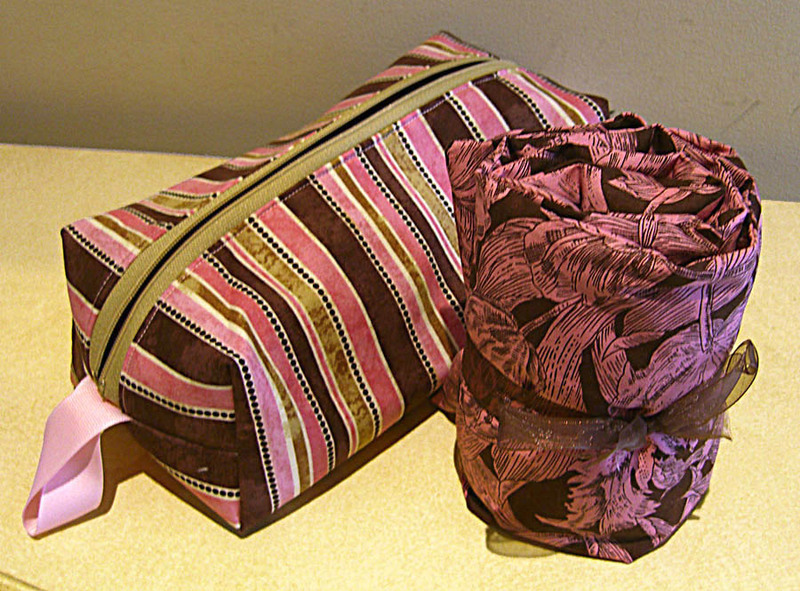 Here are a few of the A-Door-Ables projects I have sewn together using yo-yos. What a fun pattern! On two of the A-Door-Ables I have attached yo-yos. I am using the A-Door-Ables for teacher gifts. I have made other ones for children’s gifts and attached them to gift bags. 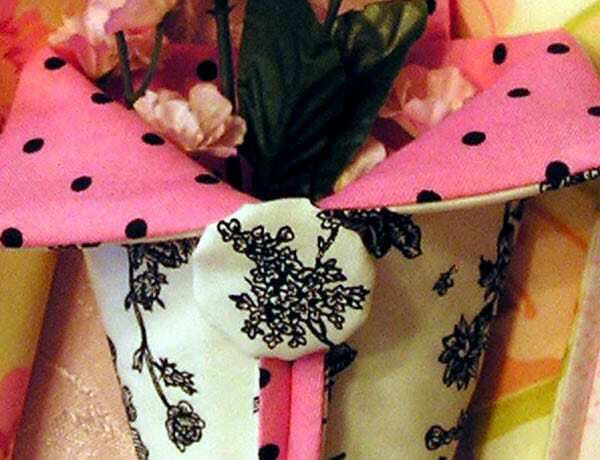 They look so pretty on gift bags with silk flowers. Julie centered the black floral motif on this yo-yo. 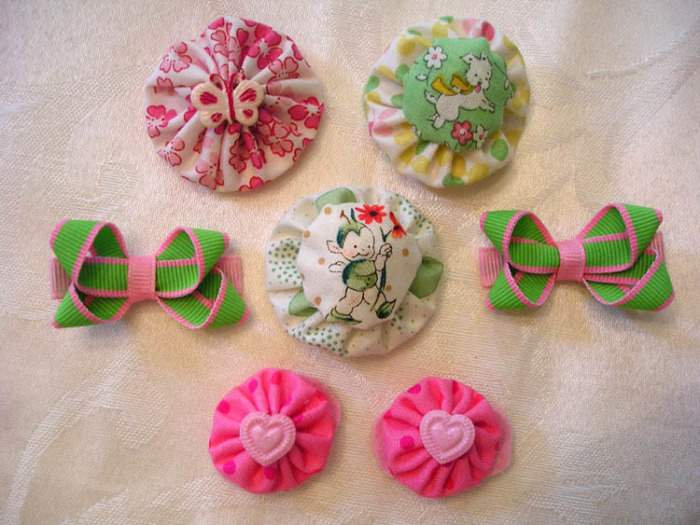 Depending on the fabric used, they can be for a baby’s room, a girl’s room, a teacher, a neighbor, etc. Instead of flowers inside, how about small gifts like jewelry, gift certificates, fat quarters, candy, or a stuffed animal? I am going to make a few for the holidays in festive fabric and hang them from garland going up the staircase. You can also hang them from door knobs, backs of dining room chairs, chest of drawer handles, chandeliers, and kitchen cabinet knobs. The possibilities are endless! I attached yo-yos onto them when there was a motif in the fabric that I wanted to bring out. 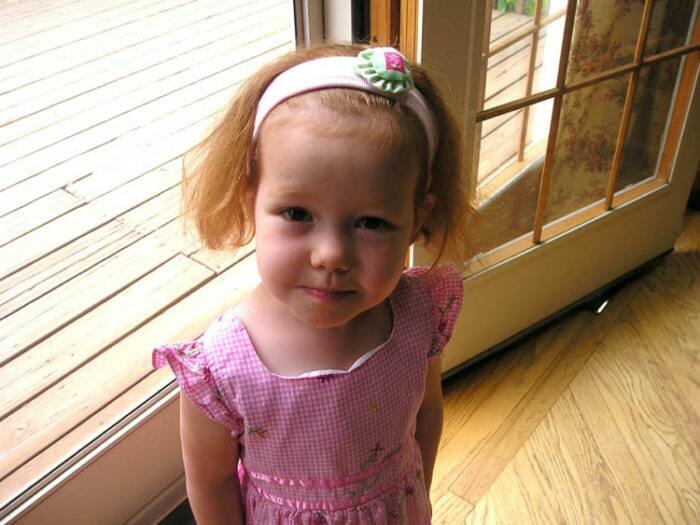 Sarah wearing yo-yo hair clip on her headband. This is Sarah. 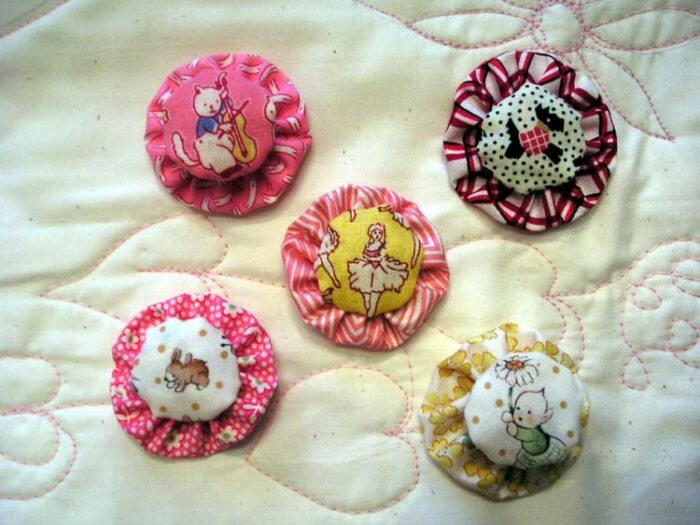 I made more yo-yos that I have turned into hair accessories for my little girls. I put a snap clip on the back of each one. I used mostly 20s and 30s repro fabric but I’m sure someone could get a totally different look using other color schemes. Using the Clover tools, I made large and small yo-yos. 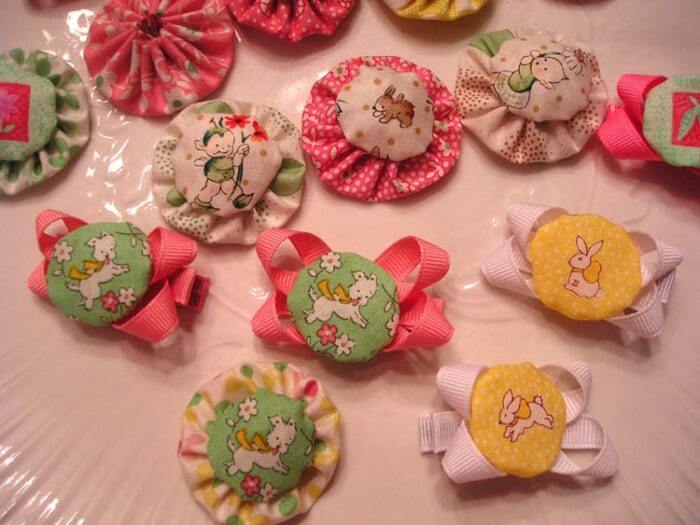 Some hair clips are made up of one yo-yo and some are made up of a small yo-yo sewn onto a large yo-yo. For some of the small ones, I attached 3/8″ grosgrain ribbon behind the yo-yo for an extra special touch. I secured small snap clips to the backs of the yo-yos. To do this, I inserted the top half of the snap clip into a piece of felt and then attached the felt to the fabric. This gives it a cleaner look. I love the new Clover tools! I’ve never made yo-yos before and have become addicted now! Thank you for sharing your creations with us! Julie used the small round (item #7001) and large round (item #7002) Clover Needlecraft Quick Yo-Yo Makers. I recently posted a tutorial for using these tools to make yo-yos here. The tutorial describes how to place your fabric to center a focal feature for the back of the yo-yo, as Julie did on many of her projects. Julie centered the round opening in the yo-yo maker tray directly over a motif, (such as the scottie dog in the fourth picture), to make sure it was centered and the right size to fit on the back of a finished yo-yo. Subscribe to our blog so you don’t miss a juicy morsel. Our A-Door-Ables pattern includes pattern pieces to make two sizes. Not including the handle, the small size finishes to approximately 5 1/2″ tall, the large finishes to approximately 7 1/2″ tall. While one fat quarter of fabric is plenty to make either size, use two or more fabrics to coordinate and accent as Julie did. I live in Melbourne Australia – where can I buy yo-yos as Clover only ships in the US? My 3 girls think the yo-yos are the best thing ever! I have just bought the small size and when time permits looking forward to making some of these things .love your newsletter . For Sue M elbourne Australia:- I am Australian Clover sell almost all quilt shops and Spotlight stores+Hobbysew stores in Australia . Oh the A-DOOR-ables are beautiful! What a perfect gift! The fabrics you chose are exquisite. The yo-yo maker is just what i need as i’ve only made them by hand and i’m too Lazy for that! 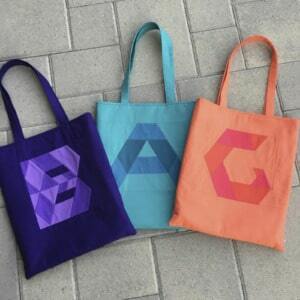 I just purchased the A-door-ables and a few other patterns. I am going to make the first project for Canine rescue and use doggie fabrics. I can’t wait to get started. Thanks for all the great patterns. I LOVE the sassy pattern and have made quite a few for me and some for gifts. Easy, fast and fun. Several years ago I made a bag full of yo-yos with the intention of making a coverlet with them…of course I haven’t done that yet. Instead I made a game for my granddaughter out of some of them. I gave her 10 of 1 kind, 9 of another, and so on down to 1 of 1 kind. Now we can sort them by color or like and different, count them, put them into different shapes and so forth. I put all of them in a cute plastic container and she loves them! i would like to know if there is a web for center pieces made out of yo yos. How long is the handle on the A-Door-Able?